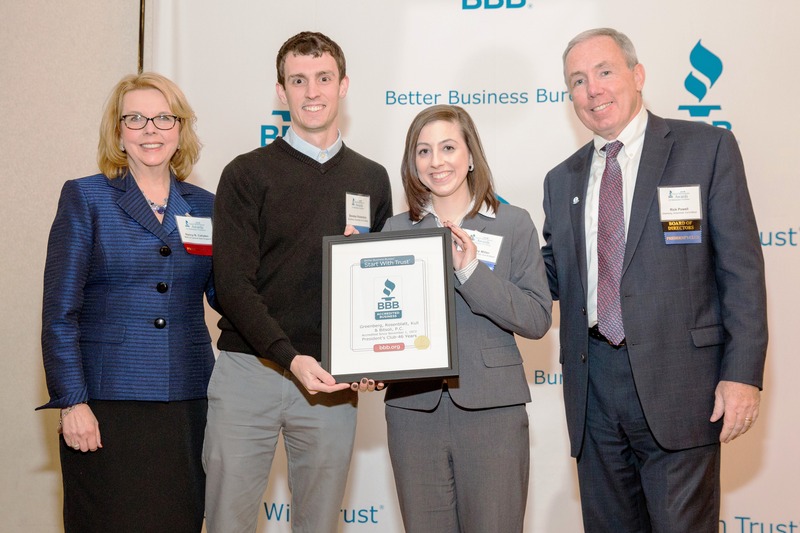 On Wednesday, November 14, 2018, The Better Business Bureau of Central New England hosted their annual Central MA Awards for Marketplace Excellence at the Manor in West Boylston. Greenberg, Rosenblatt, Kull & Bitsoli, P.C. (GRKB) Senior Vice President, Rick Powell, serves as Chairman of the Board of the Better Business Bureau. During the Awards program, GRKB was recognized with a President’s Club Award for celebrating 46 years of membership. GRKB employees Courtney Miller and Brendan Robertson attended the event and graciously accepted the award.